Over the last few decades, trenchless sewer repair solutions have gained prominence as a useful, less invasive alternative to sewer excavation. At A1 Sewer & Drain Services, we use sewer relining, pipe bursting, and other trenchless repair methods to fix underground water pipes with little to no digging. From minor cracks and holes to serious sewer and water main line problems, many underground pipes can be fixed quickly and effectively with trenchless repairs. To find out more about trenchless sewer repair in NJ, call us any time at A1 Sewer & Drain Services, at 201-645-0888. Since the 1990s, trenchless solutions have become a preferred sewer repair method for many contractors. There are several different approaches to trenchless sewer repair that NJ sewer plumbers can use to fix or even replace sections of sewer line without digging. Trenchless sewer repair is often favored since it’s quicker and less disruptive than sewer excavation for sewer repair. Sewer relining involves inserting a flexible liner into the inside of the sewer pipe, which is hardened in place to create a water-resistant and corrosion-resistant sleeve that patches up cracks and holes. Sewer pipe lining is a common method for fixing minor problems with underground pipes, without the need for extensive excavation. Pipe bursting allows NJ plumbers to break apart an old, severely damaged or collapsed sewer pipe, pulling a new pipe into place behind it. 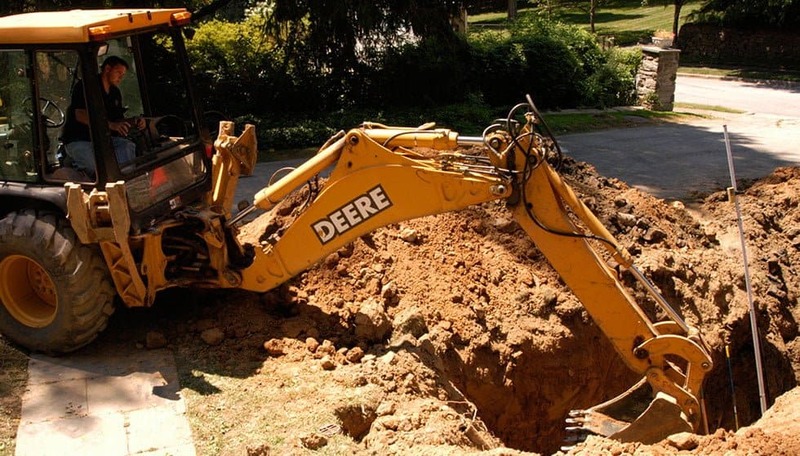 This excavation-free sewer replacement method helps minimize disruption for homeowners when most or all of the sewer pipe needs to be completely replaced. 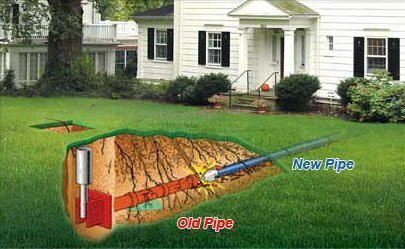 Trenchless sewer repair solutions of all kinds help simplify the process for homeowners by eliminating excavation that can disturb your lawn and landscaping. To find out more about sewer repair with trenchless technologies, call us any time at A1 Sewer & Drain Services, at 201-645-0888. 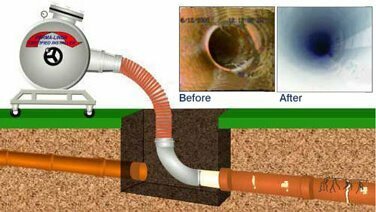 Sewer relining techniques are commonly used for pipes that still retain most of their structural integrity, but that have holes or cracks that require professional sewer repairs. Pipe relining is a fairly quick and simple process that often requires little or no excavation, and can be carried out through the cleanout or using small excavated access points. Sewer relining can patch holes, eliminate leaks, and stop water intrusion from the surrounding soil. Pull-in-Place Pipe Lining (PIPP). In this trenchless sewer relining method, a liner tube coated in resin is put over a balloon-like pneumatic extension packer, then inserted into the pipe. Once it’s in the right location for repairs (as confirmed with sewer camera inspection), the packer is inflated so that the liner is tight against the walls of the pipe. Heat or UV radiation is used to cure the resin in place. Afterward, the packer is removed. This entire process can be accomplished using only the sewer cleanout as an access point. Inversion relining. In inversion relining, an inverting bladder carries the liner through an access point to the location where repairs are needed. As with PIPP lining, it is cured in place with heat or UV light. Double inversion relining. In double inversion relining, limited sewer excavation is needed to remove a section of sewer pipe. Then, pressure is maintained while a camera is used to find the right location for the liner. The bladder is removed once the resin has been cured. Pull-in-Place Pipe Lateral Relining. PIPP can also be used to reline the whole length of a sewer pipe. A cable is strung from the cleanout, through the sewer pipe, to a sewer manhole at the street that connects with the sewer main lines. The liner, which has a secondary nonstick skin attacked, is pulled with a pneumatic bladder that runs the entire length of the pipe. The cable pulls them through the cleanout, and when in place, the resin is hardened. 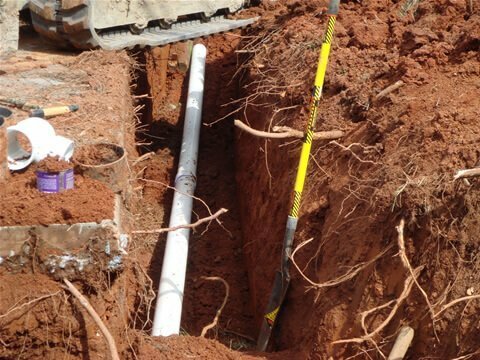 Trenchless pipe bursting can be used for complete and partial sewer line replacement in many cases, limiting the amount of excavation that will be needed. 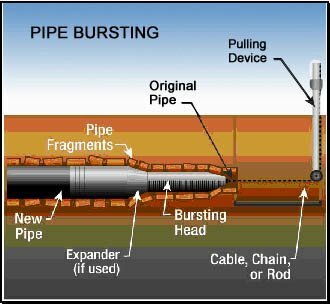 In pipe bursting, a hydraulic bursting head is pulled by a cable through the pipe, breaking apart the old sewer line and pushing the pieces outward. Then, a new pipe is pulled into place where the old one used to be. This system is even able to go around corners and bends in the sewer line. Looking for trenchless sewer repair solutions from experienced NJ plumbers? Call us any time at A1 Sewer & Drain Services, at 201-645-0888.